Startup Aims To Install Pipelines With Helicopters...Really! Startup Aims To Install Pipelines With Helicopters…Really! A major earthquake strikes a town leaving power plants damaged, water pipelines broken, and roads blocked. How will people get clean water? A new startup says it has the answer. TOHL, which stands for Tubing Operations for Humanitarian Logistics, has developed a simple method to deliver fresh water for emergency relief: install a really long plastic tube with a helicopter. And it works. The first trial run demonstrated that 1 km of high-density polyethylene pipe could be laid down over mountainous terrain and in windy conditions in just nine minutes. It’s a rapidly deployable solution with low labor cost and overhead. We even have an inside scoop from VP of Engineering Melissa McCoy about the company’s plans. 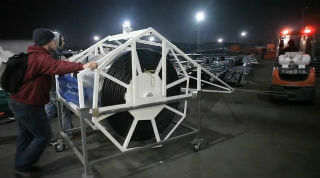 TOHL is bringing rapid deployment of pipelines for various applications, such as emergency relief. Using Kickstarter to raise $30,000 for the next phase of development, the team wants to expand the uses of their approach (such as water for agriculture and fuel for the military), improve equipment design to accommodate tube variations, and make their mobile infrastructure operation scalable and commercially ready. It’s just one example of how low-tech approaches can sometimes be the most elegant, straightforward solutions. Catastrophic natural disasters, such as Hurricane Katrina, affect infrastructure in a variety of ways. The problems created by these events are fixable if they occurred independently, but in combination, the scale of the disaster escalates quickly. For instance, water pumps and waste water treatment plants rely on electricity, so when power is lost for long periods of time, reserves are depleted and bottled water must be transported into the zone, usually by truck. However, if roads are flooded or destroyed, rapid and widescale relief becomes near to impossible. Now laying a pipe with a helicopter has its challenges. First of all, the helicopter is actually anchored to the ground during installation, so the spool must be engineered properly to avoid any significant tension in the line or the helicopter will be in jeopardy, especially in unstable weather conditions. Another issue is finding the right tubing that is flexible enough to wind up on a spool but resilient enough to not bend or break, either from internal fluid pressure or by being cut by plants and rocks on the landscape. Finally, the system must steadily extend the tubing to avoid stuttering and buckling that can occur when there’s too much slack. Because of how quickly the homogeneous pipeline can be installed, TOHL is ideal for disaster relief, but the system can be used for longer-term scenarios, such as setting up refuge camps. Though the tubing laid on top of the trees during the test run, more permanent pipelines can be installed by laying a tube along roads or rivers, digging a trench, and burying it. Installations along roads opens up the possibilities of using trucks to lay the pipeline, as well. The pipelines could also be used to deliver other fluids, such as fuels, as long as the material is resilient to whatever flows through it. The company got off the ground initially with an Indiegogo crowdfunded campaign for $5,000 back in March followed by $40,000 from Start-Up Chile. Since then, it formed a partnership with Ecocopter, an ecotourism company that has been “providing helicopter services for free and advising us on technical issues,” according to McCoy. TOHL also has a partnership with the Chilean Red Cross, whose land was actually the site for the first test, that has led to planned installations of 8 km of pipeline in two municipalities to aid families. Recently, it had its first sale to install 15 km of pipeline to SQM Inc., a large mining company in Chile where McCoy was an intern in 2010 while studying at Georgia Tech. Getting clean water to people in need in an fast and efficient way is a no-brainer, but now TOHL is providing the solution to make this a reality.